From surgeons to scholars, these female emojis are fierce. Unless your occupation happens to be dancing around in a red dress, then there probably isn't an emoji that represents your career. So, according to Google, there needs to be a greater range of 'professional women' emojis to choose from, representing the diversity of women's careers. While the depictions of women on our emoji keyboard currently include princesses and brides, the tech giant would like to see doctors, teachers and businesswomen joining the line-up. In a presentation to Unicode, the organisation that manages and approves emoji, Google staff explained they wanted to 'increase the representation of women in emoji'. 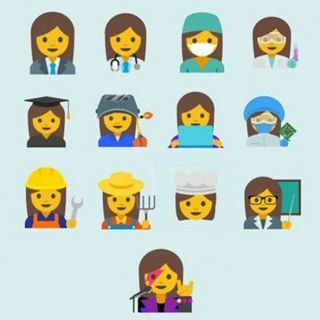 'Our proposal is to create a new set of emoji that represents a wide range of professions for women and men with a goal of highlighting the diversity of women's careers and empowering girls everywhere,' they wrote. It makes sense that women are fairly represented – a recent report found that women use them more frequently than men, with 78% of females regularly adding the little symbols to their messages. The Google team have suggested 13 new emoji options, covering professions such as farming, technology and manufacturing. Just one thing we want to know – where is the Good Housekeeping cake tester one?